Previous Video DJI Goggle for Mavic Pro drone is ready! 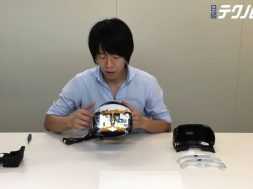 Here we have the first teardown video of the PlayStation VR. The language is in Japanese, but it is cool to see all the parts. It seems that Sony put all the parts in one unit together with the lenses and OLED screen. PlayStation VR will also be roomscale compatible! previous DJI Goggle for Mavic Pro drone is ready!